On Monday, Apr. 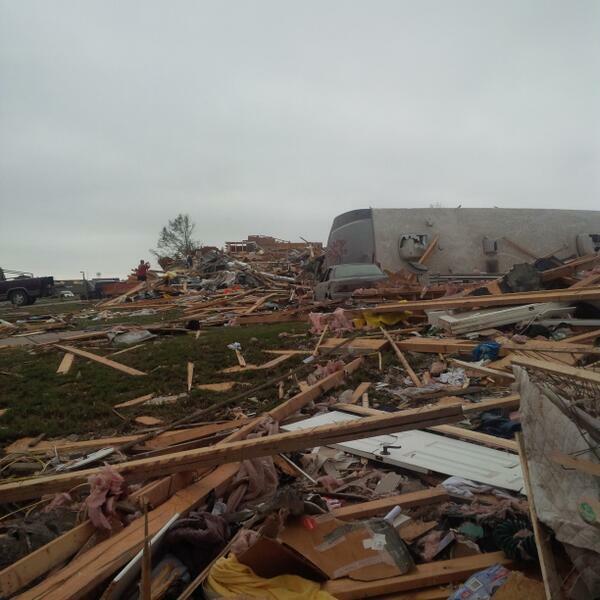 29, several tornadoes touched down and tore through Arkansas, Oklahoma and Kansas. Currently, 16 people have been killed in Arkansas as well as one more in Oklahoma. Vilonia, Ak. was finally recovering for the devastating tornado that happened three years ago, when another throw through the little town outside of Little Rock on Monday. It touched down around 7 p.m. and carved an 80 mile path that grew to be about a half-mile wide. This tornado was the largest of several produced by a powerful storm system, reports UsNews. Another tornado touched down in Oklahoma– killing one and destroying 60 to 70 house and injuring more than two dozen people. “The weather service’s North Little Rock office said it was virtually certain that the Mayflower and Vilonia storm would be rated as the nation’s strongest twister to date,” said UsNews. Meteorologist Jeff Hood said that the tornadoes had the potential to be EF3 or greater. According to Ready.gov, tornadoes are creating from powerful thunderstorms. The NAAO’s National Weather Service rates tornadoes on the Enhanced Fujita Scale or EF Scale. NAAO rates tornadoes from the weakest, EF0, to the strongest, EF5, which is described as incredible. EF 3 is described as severe. The weather channel has determined that April, May and June has the most tornadoes. If tornadoes like Arkansas and Oklahoma experienced Monday continue, we are in for a long couple of months.